On October 9, 2014, a press conference was held at Security Mutual Life, to announce and present area Charities with the proceeds from the August 28th "Mudcat Grant All-Star Golf Tournament". 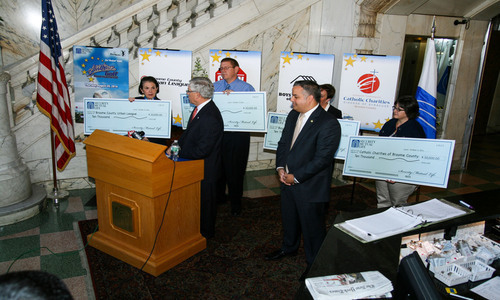 Catholic Charities, along with the Broome County Urban League, The Binghamton Boy's and Girls Club and the Community Outreach Hunger Warehouse (CHOW), were each presented with a check for $10,000 by Security Mutual Life Chairman, President & CEO Bruce W. Boyea and Binghamton Mayor Richard David. These funds will be used by all 4 charities to help multiple youth and families in the community. Catholic Charities is grateful to Security Mutual, the Sponsors, and the participating celebrities for their support with this event, and for their dedication in working with the charities for the betterment of our community.